The Gold Line station adjacent to Azusa Pacific University, Citrus College and the Rosedale development. Citrus Avenue will run under the tracks, connecting East Promenade to Foothill Boulevard. Below is a photo from Google Maps taken before the train platform and garage were completed. The city of Azusa and Azusa Pacific University are concerned because an extension of Citrus Boulevard from the south side of the tracks (i.e. 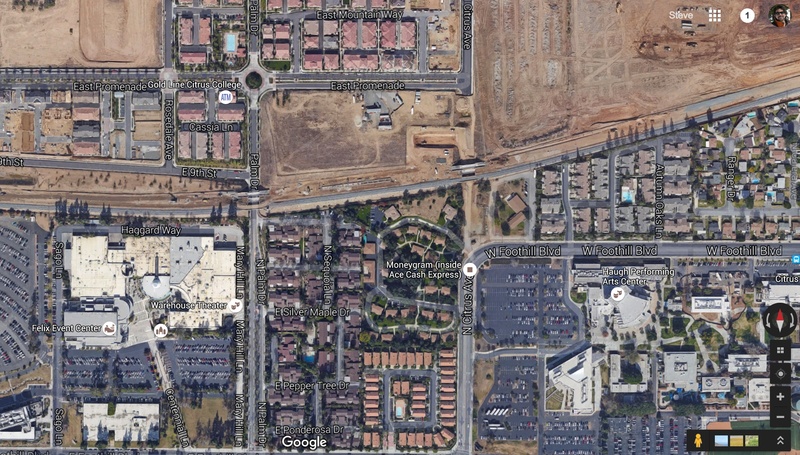 Foothill Boulevard) to the station and its parking garage has yet to be completed. The Trib reports that the cities of Azusa and Glendora and the Rosedale development — which sits to the north of the station — couldn’t agree on the road’s alignment and are worried about traffic cutting through Rosedale’s narrow streets to reach the parking garage and station. 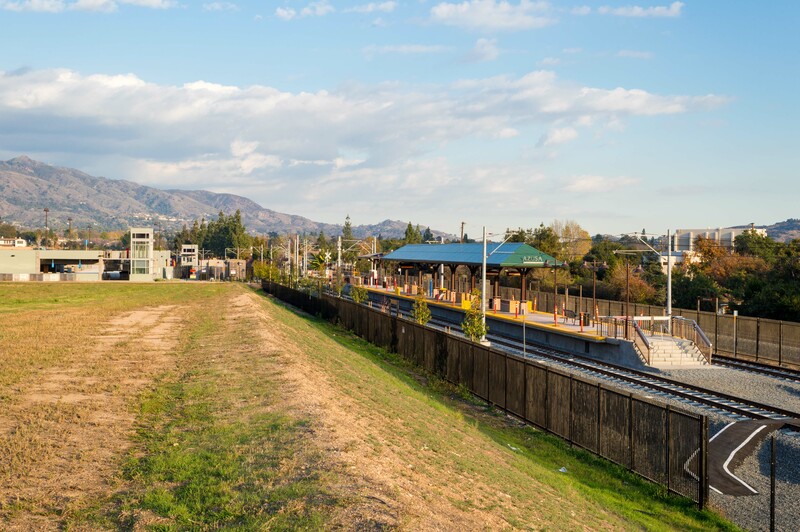 The 11.5-mile Gold Line extension from Sierra Madre Villa Station in Pasadena to Azusa is scheduled to open March 5. There is another station in Downtown Azusa. 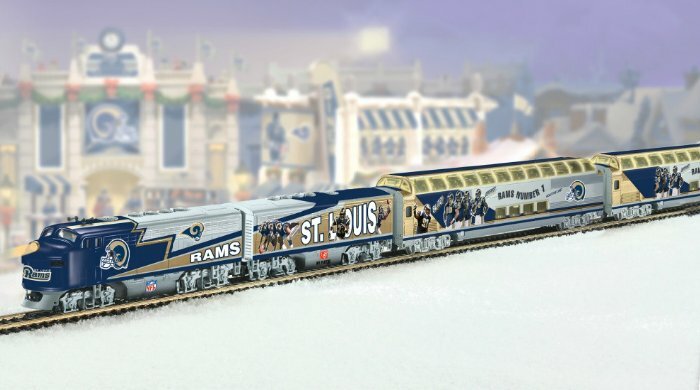 A real train may not go directly to the new Inglewood football stadium, but you can buy this toy train and pretend you’re bypassing game traffic by clicking above. Photo: Corosta.com. The one public transportation bright spot is the Los Angeles Memorial Coliseum, which could serve as the temporary home for the NFL until a new stadium is built. The Coliseum is right next to the Expo Line, providing an easy connection for anyone who wants to take the train to a game. Professional football left Los Angeles in an era of cars. The Rams moved to Anaheim in 1980, the Raiders left for Oakland after the 1994 season and the Chargers shifted to San Diego in 1961. The NFL is on the cusp of returning to a more multi-modal L.A., with new rail lines and bus and bike lanes. If the NFL does commit to sending one or more teams back to Los Angeles, the team owners and host city need to make transportation choices a top priority, not an afterthought. Kerry also reports that as part of the Inglewood proposal, there will be shuttle buses between the stadium and the Crenshaw/LAX Line. Still, if you’re planning to use LAX, it might be a wise idea to avoid those Sunday afternoon flights once the stadium opens 😁. In the meantime, you’ll be able to take the Expo Line to the L.A. Coliseum later this year to see the Rams. Here’s the Go Metro guide to attending USC football games. Related: the LAT provides an introduction to your Los Angeles Rams. I had a hard time getting past the opening graph, which reminded me that Case Keenum is the incumbent starting QB with Nick Foles as the backup. I’m of the mind that most NFL teams no longer know or have the patience to develop QBs, which is too bad for Foles — who played well in the past with the Eagles in the tough NFC East. That said, if I was the Rams and wanted to make a splash in L.A., I’d trade for Drew Brees or, at the least, bring in RGIII or Colin Kaepernick to compete for the starting QB job. No Johnny Manziel, please.
.@STLMetro That is far too classy a response to losing a team and says a lot about the great people of the St. Louis metro area. One other thought: I personally hope this ends NFL relocation madness for the time being and that the Chargers and Raiders end up staying in place in San Diego and Oakland, respectively. Moves such as these cause a lot of fan heartbreak and our gain yesterday came at the expense of a city who did nothing wrong other than try to protect taxpayer money. As he did in his 2014 address, Obama claimed that the U.S. has “cut carbon pollution more than any other country on Earth.” That’s true, at least in terms of the total tonnage of emissions reduced. However, other countries have reduced their emissions by a larger percentage than the U.S.
[snip] The U.S., the second largest emitter of carbon pollution, reduced its emissions by 583 million metric tons between 2003 and 2012. That’s more than any other country, according to Energy Information Administration data. But that’s also a 10% reduction, and other nations including France (10.7%) and the United Kingdom (12.9%), to name a few, saw larger percentage reductions during that time period. There have been a number of rules put in place during Obama’s tenure as president that should make cars and trucks more fuel efficient and cleaner in the coming years. The outstanding question: whether those gains will be wiped out by people driving more. The headline is more interesting than the article. For those not convinced yet that having cheap/abundant parking at a destination makes people more likely to drive. But despite all the attention given to the urban gentrification of U.S. neighborhoods, the reality is that struggling, persistently poor neighborhoods in Chicago and L.A. greatly outnumber those that are attracting younger, more educated, affluent residents. More troubling still, very few struggling, persistently poor neighborhoods have seen their fortunes improve over these four decades, and the great majority have remained consistently disadvantaged over time. Where anything resembling what we tend to think of as gentrification has taken place, it has been mainly in former industrial zones or working class neighborhoods. Delmelle’s detailed research suggests that, when all is said and done, racially concentrated disadvantage remains a much bigger urban problem than gentrification. Sounds about right. I’m guessing rising housing costs and stagnant wages are significant factors in these neighborhoods. Jet airplanes contribute two percent of the world’s greenhouse gas emissions. The good news: jets have reduced emissions in recent years, although those gains have been wiped out by the increased popularity of flying. The article focuses on NASA research at Edwards Air Force base on advance technologies that could make planes cleaner in the future. 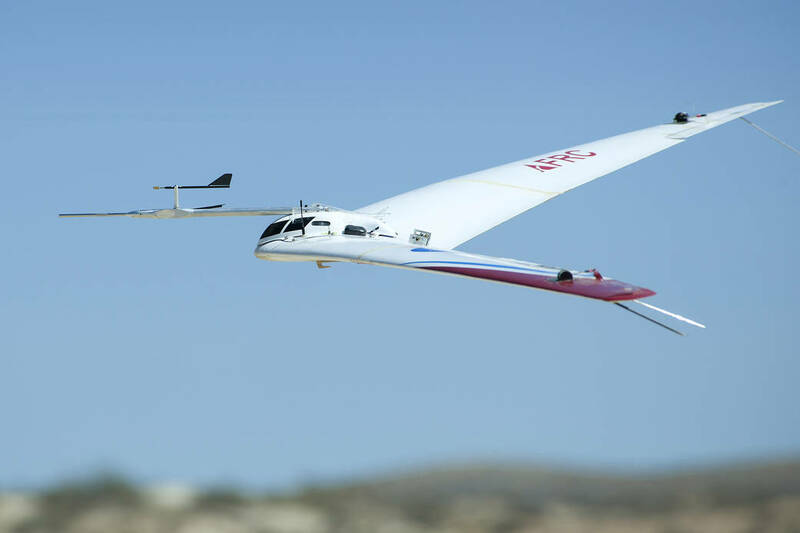 One way: wings that shift shape during flight to help reduce drag. Interesting stuff. Jan. 12: more on the relationship between rail transit and pro football. Jan. 11: plugging the gaps in our regional transportation system. Jan. 6: untransit-friendly stadium proposals and our poll asking if would you Go Metro to see the Chargers, Raiders or Rams in Los Angeles. Jan. 5: the city of Santa Monica wants to build fencing to keep people off the Expo Line tracks. Dec. 31: a few thoughts on transpo trends in 2015. I’m on Twitter and have a photography blog. Questions or ideas for How We Roll? Email me. Good planning does not always involve building development where rail exists but instead build rail where new development is being planned or exists. This idea of running shuttle buses to a major venue when a stub could be built from a still under construction light rail line seems like a much better idea. While there was major development along the P.E. after the tracks were laidWest coast it was because Henry Huntington was also a developer and it was good business. On the other hand the L.A. Railway went where the development in most cases had already taken place. That was the reason for the most direct route not being fallowed. Concerning Obama’s Address. Yes, we should replace dirty forms of energy but not as he is proposing and is currently fallowing whereby coal for instance is being forced out without a viable replacement. Wind is great but it can’t replace coal fired furnaces to provide electricity. Natural Gas is only a stop gap. The same can be said for CNG for use in vehicles. And electric vehicles have not proved to be a suitable replacement for gas and diesel. Just look at the MTA’s current experiment with electric buses. They break down and don’t have the same operating capacity as CNG. Lastly, Obamas claim gas is two dollars a gallon might be the case on the east coast but certainly not here. Crazy regulations make those on the West coast and especially in California pay twice as much. This is one nation and there should be one standard. Lastly, all this talk about ways to achieve cleaner air in Los Angeles and one of the largest causes is cars and buses sitting in grid lock traffic for hours. From my observations the East-West corridor from the Westside to Downtown Los Angeles via Sunset Bl. and Santa Monica Bl. is the longest and slowest of anyplace in the Los Angeles area including freeways. Has the MTA addressed it? No!! Instead they insist on building light rail into areas where animals in some cases out number humans. Yesterday’s SOTU was nothing but more lies and empty rhetoric from Obama. I’m not seeing gas under two bucks anywhere in LA. The areas in red on the CityLab map, like South Central Los Angeles, have innate disadvantages even when you take out the high poverty and lack of development. They are park poor and underneath the LAX flight path. Many of them are near hazardous industrial sites like the Exide battery recycling plant. They are historically gang ridden, with the legacy of violence reflected by unpainted graffiti, bars on the windows (even second and third stories of houses and apartments), and bullet proof glass at fast food restaurants and gas stations. I think they have tremendous possibilities for densification, especially given the good transit access in those areas, but existing residents in the somewhat stable blocks of those areas think that adding more apartments will destabilize those areas. Rather, they are densifying organically, by people taking on extended family or friends and resulting in housing overcrowding. Re the Citrus Ave extension to the new LR station, Metro should go ahead and open on schedule. A little traffic jam on the other access road will induce the parties to stop splitting hairs about the alleged ‘road alignment’ issue. The ROW is open, just build the damn road! This might be a stretch, but I bet Stan Kroenke would consider chipping in to get the LAX People Mover extended to the Rams’ new stadium right down the road. The 2024 Olympic bid would get an even greater boost if people could go straight from the airport to one of the main event centers. This wouldnt be a stretch at all given Kroenke’s investments in sports. This stadium keeps being touted as being the best in the world upon completion. The experience getting to and from has to be a part of that hopefully. Metro should just open the APU/Citrus Station as scheduled. A little traffic and inconvenience is much better than disappointing all the college students and employees and risk losing those riders forever. I think the GL Construction Authority and City of Azusa just have to make things safe for everyone while finishing the roads and parking structure. The ball is on their court. So no one on the public payroll can figure out how to build a pedestrian path through a construction zone? How I love Southern California and what it has become! Brees, yes. Don’t like RG3, Kaepernick or Manziel, all for different reasons. My favorite Rams QB of all time, though, other than Namath (who will always be a Jet) was Warren Beatty! Excellent point. “Heaven Can Wait” was terrific for many reasons, including it showed the Rams beating the Steelers. Any team that beats the Steelers is a friend of mine.